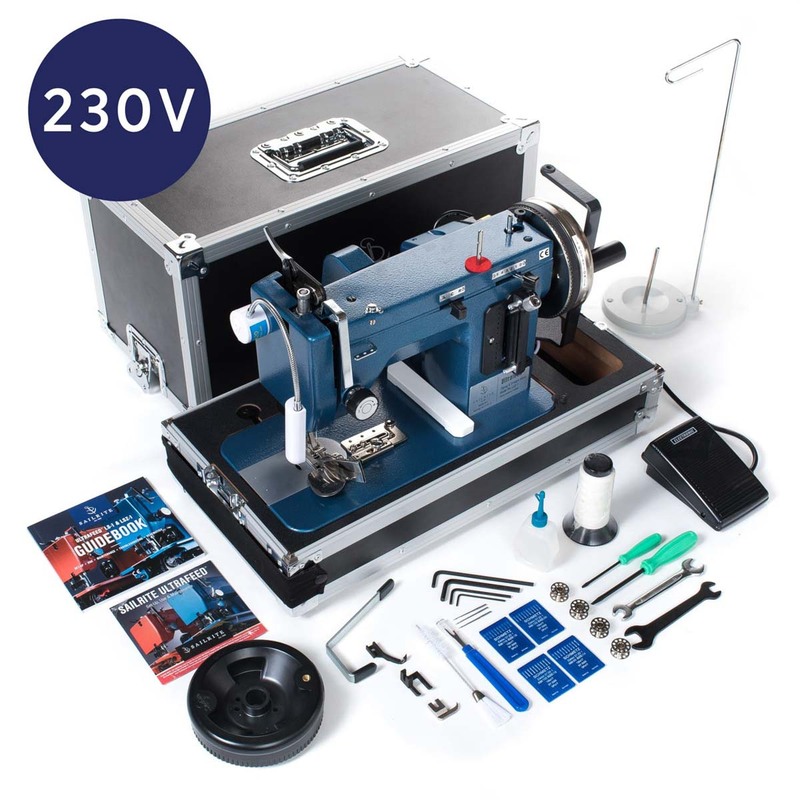 The Sailrite Ultrafeed LSZ-1 PREMIUM (220–240V/50 Hz) Sewing Machine package features our powerful, portable, straight stitch/zigzag walking foot sewing machine loaded up with all of our best accessories. This package is perfect for someone who needs an easily portable, heavy-duty machine, for boat owners looking to sew heavy canvas or sails, or for the sewer who wants all the bells and whistles. With the Ultrafeed Premium Package you not only get the standard Power Plus Balance Wheel, but also the extra large, extra powerful Monster II Balance Wheel. The Monster II is a solid 7 lb. nickel-plated steel balance wheel with twice the size and power of a traditional balance wheel. It also comes with a hand crank and creates enough momentum to sew even heavy fabrics without electricity. Powering the machine is a 220–240 VAC motor (10,400 rpm at 0.7 amps) and a cogged belt and pulley drive system. Operate using the fully grounded, variable speed, electronic foot control with a 2-pin European plug. An extra wide (19mm) zigzag mechanical walking presser foot works with the feed dog to pull thick layers of fabric through the machine at consistent speeds for symmetrical stitching. The EZ Set Stitch Length Plate helps to keep stitch length consistent when switching from forward to reverse. Switching directions is made quick and easy by the spring loaded stitch length lever. The presser foot features a built-in welting tunnel for sewing piping and a needle positioning lever moves the needle left, right and center so you can sew marine zippers without changing the foot. For those times when you need the needle even closer to what you are sewing, this package includes a left roping zipper foot.